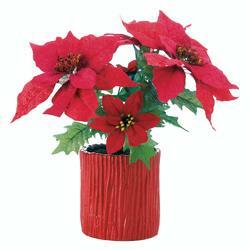 The red wooden-look base of this faux poinsettia plant makes it a perfectly festive holiday decoration for your mantel or tabletop. The bright red faux poinsettia flowers and green leaves will look great season after season. Weight 1.5 pounds. 9.5" x 9.5" x 15.5". Plastic, Fabric, Polyresin. UPC Number: 849179033163.